Promotions and timely pricecuts can actually make a metagame out of buying games, says Valve's director of business development. Valve's Jason Holtman, director of business development, said today at the Montreal International Game Summit that the digital games market is very different from the way the industry has operated for years in the retail market. The idea that once a game is discounted, it must then stay in the bargain bin, is not valid in digital sales. 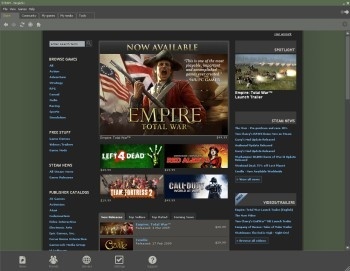 He cited several examples of gamer purchasing habits on Steam and urged others to experiment with traditionally held notions. Doing so can create a sort of metagame for the consumer. Holtman cited two promotions as examples. For six hours one day, Valve sold Team Fortress 2 for $2.50, marked down from $19.99, without any ad campaign or marketing, and their revenue "jumped up dramatically." The price then went back to normal and gamers were still flocking to purchase the game again, perhaps because of the buzz the "sale" created. For a Left 4 Dead promotion, Steam sold the game for half-price one weekend, and the retail sales were unaffected. "We moved more units of Left 4 Dead on that weekend than we did at launch," Holtman said. "There was a meta game of people buying and selling [Team Fortress 2]," he said. "They thought they were exploiting us by buying a bunch of gifts - we love it when people buy a bunch of gifts. They were stockpiling the game."